Ground Penetrating Radar Systems, LLC. serving the entire state of Arizona as well as nationwide, was contacted by a major contractor to conduct a one acre survey of a remote property in the Four Corners area of Rockpoint, AZ on the Navajo Indian Reservation. Ground Penetrating Radar Systems was required to immediately respond overnight to this extremely remote community. Finding a private utility locator in such remote territory was a major challenge to the contractor who had a tight construction deadline to maintain while ensuring that they avoid any risk to damaging existing underground utilities. GPRS was able to respond immediately and travel to the remote location and locate the necessary underground utilities including gas and water lines, using ground penetrating radar and signal induction technologies. Ground Penetrating Radar was ideal on this site as it was a facility that had ongoing construction in progress with many people on site working. GPR does not require evacuation of the area as does traditional x-ray concrete imaging. GPR emits no radiation and is completely safe to be near. Traditional x-ray is mostly done after hours whereas GPR can be done during normal business hours. All data findings are marked directly on the surface at the customer’s request for the easiest interpretation of the scanning provided. With GPR, there is no wait for developing film as with traditional x-ray. Only one side of the slab is needed for scanning, thus time and resources are efficiently save and ideal for tight project schedules or unforeseen emergencies. Ground Penetrating Radar is the new way to x-ray! Ground Penetrating Radar Systems, LLC. specializes in ground penetrating radar service and is our primary source of revenue. With that in mind, the amount of experience and specialization of concrete imaging and investigations as well as a nationwide network of project managers; GPRS, LLC. is unrivaled in the industry. GPRS, LLC. can supply your project with the safest and most accurate ground penetrating radar service in the business. Your safety and job efficiency is our main goal at Ground Penetrating Radar Systems, LLC. We are the experts in GPR. Ground Penetrating Radar mapping is a great tool to scan areas of post tension cables, rebar, and conduits, including PVC pipes. Ground penetrating radar can also be used to locate underground utilities such as water, gas, electrical, communication, sewer, and other objects prior to digging, soil boring, or excavating. Please contact Ground Penetrating Radar Systems – GPRS to learn how we can assist with your next project. If you are interested in learning more about our concrete imaging capabilities or other Ground Penetrating Radar applications such as locating utilities and sub-surface anomalies along a proposed pipeline trench, Underground Storage Tanks (USTs) locating, clearing boring locations of possible utilities for soil samples, underground or under-concrete void detection, or even structural investigations. Don’t hesitate to contact us for a demonstration or lunch and learn session – let us buy your team lunch so we can tell you more about our company and what we can offer your company and projects. 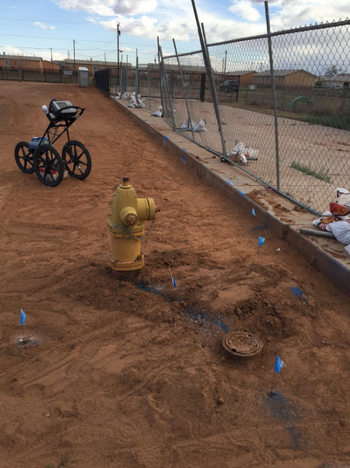 GPRS has done many projects such as this in Phoenix, Tucson, Yuma, Flagstaff, Prescott, Kingman, Showlow, and throughout the entire state of Arizona and performs GPR surveys throughout the United States. Contact Nate Holscher (Regional Manager) at (480) 227-8614 or nate.holscher@gp-radar.com today to schedule an appointment for a free demonstration or if you have any inquiries for your next project.